About US: Glasgow Radiator Key Personnel, Sales Team, Group Companies at Glasgow Radiator. Glasgow Radiator, G&M's Radiator Repair Division, has been completely redeveloped in the recent years, to become one of the best radiator repair shops in the country. It offers a range of services covering the repair and replacement of all types of radiator, ranging from automotive, commercial through to the heaviest plant, off-highway and marine applications. It also has Shot-blasting facilities available. For larger applications Glasgow Radiator is one of the few Repairers in the UK able and willing to undertake such work. John McGeady is Glasgow Radiator`s Business Manager. Having spent over 30 years in the Radiator Repair Industry in both repairing and management, John has the highest appreciation of what Quality, Service and Value for money mean to all Glasgow Radiator customers. 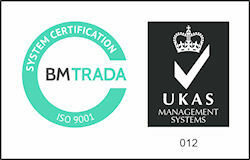 Glasgow Radiator are certified to ISO9001:2015 for the Manufacture of Automotive, Commercial and Industrial Radiators, Radiator Cores and Associated Components. Glasgow Radiator uses such processes as FMEA, PPAP, Control Plans, Process Flow Charts, Process Work Instructions and our Quality Management System to ensure parts are fit for application and manufacture is controlled.